There’s nothing quite like being in a hotel room with everyone fighting over that lone phone charger or outlet. If you’re similar to us and you’ve got a combination of smart devices then finding a docking station for all generations of phones/computers can be tricky. But, here’s a great solution: the UDOQ 400 Power for Apple and for Android. 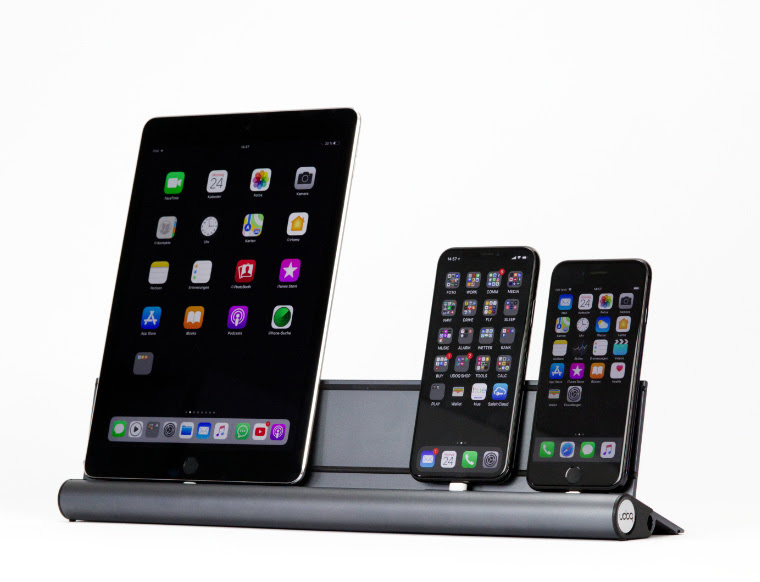 This luxury docking station charges up to five devices at once (including smart watches, ereaders, tablets, phones and music players). The patented udoq connector cables are inserted from the side and the base plate shown above keeps the devices in an ideal viewing state (so music, photos and recipes remain easily seen while charing). It’s a great way to organize the chaos of multiple devices and cables. Travel pillows, while good in theory, are often quite uncomfortable. Very few prevent that dreaded forward-head-bob action that so many of us experience. The TRTL Travel Pillow promises to fix that with an internal support system buried within soft fleece. If you’ve got someone on your list that spends a lot of time on the road, or in the air, this is a good gift option. Image c/o TRTLTravel.comAlthough we have yet to try this, the Trtl Pillow website says it holds the head and neck in a better ergonomic position than a traditional travel pillow. It’s a wrap around style and comes in a variety of colours and it’s half the size of those U-shaped pillows. We’ve been advocates of noise-cancelling headphones for years (long before this blog existed). When you’re on a crowded plane or train, there’s nothing quite like something that helps mute all of the chaos and energy around you. 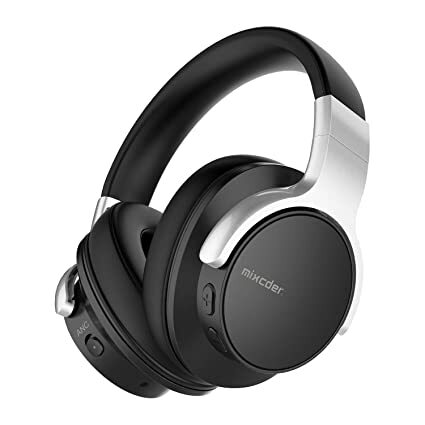 The Mixcder E7 Active Noise Canceling Bluetooth over the ear Hi-Fi stereo headphones feature deep bass and deliver on the company’s mission to create premium noise canceling headphones at an affordable price. The technology used in the headphones continuously detects and reacts to outside noises, analyzing sound waves and blocking out ambient sound by creating inverse waves for a totally immersive experience. Right now, they’re on sale from $189 usd to $59-$79 on their website. For Canadian consumers, check out Amazon.ca where they’re listed as $59. This Apple device has been on the market for a while but it’s a great, affordable gift for travelers who take a lot of photos and videos. With the Lightning to SD Card Camera Reader, it’s easy to download photos and videos from your digital camera to your iPad or iPhone so you can view them and share them with family and friends. After you insert the SD card into the reader, your iPad or iPhone automatically opens the Photos app, which organizes your photos into Moments, Collections and Years. And when you use iCloud Photo Library, all your full-resolution photos and videos are stored safely in iCloud and automatically added to the Photos app on all your devices. Available at: Staples, Apple, SportChek, Amazon.ca and most other retailers that carry these sorts of cables. I feel like we don’t need to write much about these Air Pods. We’ve seen them everywhere and on nearly everyone. Our family hasn’t tried them yet, but we have friends that say they’re amazing and worth every penny. While they don’t block out noise (like the ones mentioned previously) they’re ideal for busy people on the go who like to travel light. They’re also ideal for those business calls where you need to be hands free so you can take notes etc. They’ve got a great battery life too which is a bonus. Get the avid traveler on your list a streaming stick. It’s such a great device for people who spend a lot of time in hotel rooms. Simply plug it into a wall-mounted TV and you’ve instantly got access to 100,000 + movies, TV shows etc. You can buy the stick directly from their website. Overall, there are a lot of great travel gadgets. This list could go on and on. We tried to highlight a few different price points. Travel gadgets don’t need to be expensive but they should be useful. Let us know what travel gadgets you love and we’ll try to include them in the next list. Thanks for everyone who sent in suggestions for this round up.